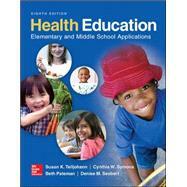 Health Education is a methods book that introduces pre-service elementary and middle school teachers to health programming. The practical approach emphasizes the skills necessary to teach health while providing background information on key health topics. Valuable activities in each chapter are aligned with National Health Education Standards and include sample assessment strategies. The new edition has been updated to include the newest national recommendations and statistics.